The plan to transfer various water supply schemes to panchayti raj institutions (PRIs) in a phased manner has not made much headway. Only the partial control of about 1,200 out of the total over 7,900 schemes has been handed over to panchayati raj bodies so far. In such cases, panchayats are taking care of only distribution of water from storage tanks. BJP’s national vice-president Shanta Kumar, Chief Minister Prem Kumar Dhumal, state president Jai Ram Thakur and PWD Minister Gulab Singh Thakur launched an attack on the Congress from Seri Munch today. Allotment of plots under a discretionary quota in the state is going to become an election issue in the coming days. It is likely to open a Pandora’s box in which politicians of the state are likely to wash their dirty linen in public blaming each other for nepotism in the allotment of plots under the discretionary quota. One more Tibetan has been given suspended death sentence with a two-year reprieve by a Chinese court in Lhasa, sources available here said. BJP candidate for the Shimla parliamentary constituency Virender Kashyap today said the currency notes controversy was a conspiracy by the Congress to defame him and he had no clue about the money that was handed over to him. Chief Minister Prem Kumar Dhumal said corruption and price rise would be main issues of the BJP in the state during the parliament polls besides local issues like unemployment etc since in Himachal Pradesh both national and local issues dominate in the parliament election. The BJP today said that with no concrete issues in its favour, the Congress had unfortunately reduced the campaign to a war of personalities and image rather than highlighting its five-year achievements. Experts from different fields today called upon all mediapersons and public relations officers (PRO) to undergo regular refresher courses and training to update their skills to keep pace with the changing needs of time. The Himalaya Niti Abhiyan (HNA), a forum of environment-related movements across the state, has called upon all political parties to state their considered position on environment-related issues. The implementation of the recommendation of the Sixth Punjab Pay Commission will put an annual burden of about Rs 1,000 crore on the state exchequer, but the actual outgo will be less as the government had already granted 20 per cent interim relief to the employees. Two suicides were reported on the outskirts of the town today. A woman jumped from balcony of the Tanda hospital and a class XII student hanged himself to death from a tree. Mortal remains of BJP leader Raj Kumari Chauhan (47) were cremated on the banks of Seer Khad near Kasol village in the Ghumarwin area today. A large number of village panchayat representatives, party leaders and Congress leaders were also present on the occasion. The District Consumer Disputes Redressal Forum has directed the dealer of the Tata Commercial Vehicle to replace the Tata Truck with a new one of the same make or refund the sale consideration of the truck to the complainant. The Irrigation and Public Health Department picked up only gravity schemes that did not involve any pumping of water, and technically easy to maintain. However, the panchayats are not in a position to operate and maintain even such schemes as they lack the requisite infrastructure. As a result, the schemes are still practically being managed by the department, which is also paying remunerations of water guards deployed by panchayats for the purpose. Each water guard is being paid Rs 700 per month, putting an additional burden of Rs 1 crore annually. The objective of decentralising the water supply system by handing over the schemes to PRIs was to ensure efficient management of schemes and recover the cost of operation and maintenance from the consumers to help reduce the financial burden on the government. However, this is not happening as there is no permanent structure at the panchayat level to carry out the job on permanent basis. Even providing training to PRI functionaries is not helping as the incumbents chsange with every election. They also face problems in appointing water guards as local unemployed persons view such jobs only as an opportunity to secure government jobs. Panchayat functionaries also come under pressure from various quarters while engaging water guards. As per the transfer scheme, the panchayats were to fix their own water tariffs to recover the cost of operation and maintenance from consumers, but this aspect has been completely ignored so far. Officers point out that handing over various functions to PRIs will be possible only if proper infrastructure and adequate trained manpower is provided to them. Efforts are now being made to identify the problem areas and German Federal Agency GTZ, which has funded the project for capacity building of PRIs, has engaged consultants to study the 1,200 schemes for the purpose. If PRIs are not able to handle small gravity schemes, they are not expected to take over the big lift schemes involving more than one panchayat and in which heavy pumping machinery is also to be maintained. In such a situation, there is little likelihood of decentralisation of water supply schemes in rural areas in near future. BJP’s national vice-president Shanta Kumar, Chief Minister Prem Kumar Dhumal, state president Jai Ram Thakur and PWD Minister Gulab Singh Thakur launched an attack on the Congress from Seri Munch today. They were addressing a gathering after taking out an impressive rally in support of BJP candidate Maheshwar Singh, who filed his nomination papers from Mandi. Though Shanta Kumar addressed the gathering at Seri Munch, he did not participate in the rally from Paddal to Seri Munch. PK Dhumal, Jai Ram Thakur and other BJP leaders accompanied Maheshwar Singh during the rally. Shanta Kumar instead stood in front of the DC office in advance and gave Dhumal and Jai Ram a surprise. The party broke its protocol on the stage as Shanta Kumar, the senior-most leader of the party from the state, was invited to speak before PK Dhumal, sending a negative signal among BJP workers. Shanta Kumar said the Congress had certain “bherias” who are responsible for corruption and skyrocketing prices, which had pushed country’s over 36 crore people below the poverty line. Dhumal attacked successive Congress governments under Virbhadra Singh and went on to charge that the UPA had always discriminated against Himachal. “On the other hand, the BJP has fulfilled its promises, gave relief to daily wagers, employees, pensioners and farmers and the downtrodden,” he claimed. Maheshwar Singh said Virbhadra Singh had to pay the price for the poor performance of his MP wife Pratibha Singh. People were openly saying that she did not solve their problems. She won just because she was CM’s wife, he said. He asked people to vote for the BJP as it would form the next government at the Centre and solve their problems. Jai Ram Thakur said Virbhadra Singh was pushed into contest not by choice but by compulsion. His main supporters had deserted him and were campaigning for the BJP. Even Sukh Ram had not come to campaign for him, he said. Highly-placed sources told The Tribune that the ruling party had compiled a list of plots issued under discretionary quota by Congress leaders during their stint in power. The sources said the list contained the names of former Chief Minister Virbhadra Singh, HPCC president Kaul Singh and other senior Congress leaders. The BJP leaders have obtained data regarding allotment of two plots in the name of daughters of Virbhadra Singh and a plot in the name of a relative of Kaul Singh under the discretionary quota. The list is likely to start a blame game among the state politicians. It would also illustrate how the discretionary powers were used by the state politicians to favour their kith and kin. The ruling party minister for transport and urban development Kishan Kapoor got the list worked out after he was targeted by the Congress leaders for getting two plots allotted in the name of his wife. Though the plots were allotted just in papers only and then cancelled, the Congress leaders, including the state Youth Congress president Manmohan Katoch, and Congress candidate from Kangra Chander Kumar obtained the details under the Right to Information Act. They levelled allegations against the BJP minister for getting plots allotted under the discretionary quota in name of his wife. The allegations are also part of the charges prepared by the Congress against the present government. However, the minister got a list prepared of the plots allotted under discretionary quota to kith and kin of senior Congress leaders to prove that he was not the only one to allot plots in the name of his kith and kin. When contacted on phone Kishan Kapoor admitted that he had got the list of plots allotted under discretionary quota by the Congress leaders prepared. He said he would reveal the list at a press conference very soon. Penkyi of Sakya County received the suspended death penalty from the Lhasa Municipal Intermediate People’s Court for allegedly setting on fire two downtown clothing shops on March 14 last year. She is 21-year-old and hails from Norbu village of Dogra township of Sakya County. She was convicted for allegedly setting on fire Hongyu Trousers on the Qingnian road leading to the death of shop owner Zuo Rencun. Another Tibetan named Penkyi of Nyemo County was sentenced to life imprisonment while Chime Lhamo, 20, was jailed for 10 years. Penkyi, 23, is from Thantoe village of Margkyang township in Nyemo County. Chinese government officials claimed the trials had been open and strictly as per the criminal law of China. The defendants were provided with Tibetan language interpreters and their attorneys had put forward their arguments in full. All accused were arrested in March, 2008. Sources available here said all three women who had been sentenced were working as sweepers in Lhasa. On April 8, the court had sentenced two Tibetans, Losang Gyaltsen and Loyak to death. Two other Tibetans, Tenzin Phuntsok and Kangtsuk, were given death sentence with two-year reprieve, while Dawa Sangpo got life imprisonment. The Kashag of the Central Tibetan Administration has termed these sentences as arbitrary. It maintained there was no due process of law in China and the courts had become political instruments of the authorities. The Kashag urged the Chinese authorities to free all Tibetan prisoners. China’s continued repression of Tibetans was fuelling even deeper resentment. The best way to resolve the issue of Tibet was to address the just concerns of the Tibetans, the Kashag added. Meanwhile, the Association of Tibetan Journalists (ATJ) has expressed disappointment over the arrest of a Tibetan writer in Ngaba. Calling on the Chinese government to immediately release Drokru Tsuiltrim, a Tibetan monk of Ngaba Gomang monastery, the association said the Chinese government had undermined a Tibetan writer’s freedom of expression and that he must be allowed to freely express his thoughts and feelings through literature. 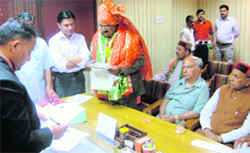 He was addressing party workers after filing his nomination papers in the presence of senior party leaders, including co-in charge of party affairs in Himachal OP Dhankar, Horticulture Minister Narender Bragta, Health Minister Rajiv Bindal, state general secretary Khushi Ram Balnatah and district BJP chief Ganesh Dutt. “The money was handed over to me at a marriage party. I had no clue about the contents of the packet. On discovering that it contained money, I handed it over to the police,” he said. He alleged this was a conspiracy by the Congress to defame him. Kashyap, who has a string of defeats to his credit, said he was getting overwhelming response from the public and he was certain of wining this time. “Considering the dismal performance of the sitting Congress MP over the last 10 years, my appeal to the people is to give me at least one chance,” he said. Kashyap said his opponent Dhani Ram Shandil had failed to fulfil the promises he had made to the people. “He has remained inaccessible and even at the time of floods and unprecedented damage caused by rain last year, he did not bother to provide help and succour to the people,” he said. He said people wanted change and they had made up their mind to vote for the BJP this time. The 58-year-old former teacher, hailing from Kainthri village in Solan, has Rs 7,500, while his wife had Rs 12,000 in cash. He and his wife have four bank accounts in Solan with Rs 2,052, Rs 35,000, Rs 14,000 and Rs 10,000 deposited in them. While he does not own a vehicle. He has agricultural land in Koti Devra and Jungle Bhalawag with a total market value of Rs 22.81 lakh. He owns a building in his name at Jawahar Park, Solan, valued at Rs 5.55 lakh. He also gets Rs 42,000 per annum as rent from his property. Touching on another issue which finds mention in BJP manifesto, Dhumal said, ‘the issue of one rank one pension finds firm commitment in the party manifesto; while separate pay commission for military and para-military forces has been promised the pay of armed personnel would be made tax free.? He said, ‘the wage of anganwadi workers and helpers would be doubled after the BJP comes to power and the party is also committed to raise the income tax exemption limit up to 3 lakh and 3.5 lakh for women; since the NDA government could not do it during its last term,? he added. Addressing a press conference here today, the co-in charge of BJP affairs in Himachal, O.P. Dhankar said with an endless list of failures to its credit during its five-year rule the Congress had deliberately kept the focus on personalities. “The Prime minister is hurt at being called weak but he must understand that it is not Manmohan Singh whom we have called weak but it is in his capacity as the PM that we have called him weak,” said Dhankar. He said even the BJP had admitted to the fact that the PM was an honest man with a clean image but to save his government he managed to win the no-confidence motion but in the process lost the trust of the nation. “The manner in which three of the BJP MPs were offered Rs 3 crore each and Rs 1 crore was paid as advance which the entire nation saw has resulted in the Prime Minister losing the image of ‘Mr Clean’, he remarked. Dhankar said the UPA regime had miserably failed in combating terrorism and failed on the internal security front as well. “During their tenure a total of 6,646 persons have lost their lives in terrorist strikes or related activities which is a record in itself,” he said. The BJP leader said the Congress had been forced on the back foot on the issue of black money in Swiss banks. “ LK Advani has promised to the nation that if voted to power the NDA would ensure that this money was brought back,” he said. “The winds of change are already blowing in Himachal and like the assembly elections, the BJP will win all the four seats,” he said. Speaking on the state-level conference on “Growing role of public relations in management and importance of your vote in democracy” organised here by the Public Relations Society of India (PRSI), Shimla chapter, to mark the National Public Relations Day, Dr Tej Pratap, Vice-Chancellor, CSK, HP Agriculture University, Palampur, who was the chief guest lauded the PRSI’s role and urged PR persons to deliver right picture of an institution with speed, creating awareness on national and social issues. Senior journalist Swaraj Chauhan said PR persons must present a factual mix of credibility, legitimacy and responsibility as day is nearing when PR professionals will be part of decision making process as they play an important role in policy formation and implementation. He said the journalists in west undergo refresher course and training as technology is changing fast, but they shy in India. PR professionals must adopt two-way communication and update themselves with the latest happenings, he added. Other speakers during the discussion, expressed concern over indifferent attitude for not exercising franchise and voters should play decisive role for which a campaign should be launched. PRSI chairman said PR today is as industry in which Rs 10,000 crore is being invested annually in the country, engaging over two lakh professionals. Our society is striving for professional excellence for the last 50 years, besides creating awareness on national and social issues, he added. The forum organised the Himalaya Bachao Rally and a two-day conference to focus attention on these issues earlier this month. It will put up project-specific demands of the affected people before the parties and ask them to approve or disapprove of the policy matters being raised by it. The main issues would be acquisition of land for mega projects in the name of public interest and ensuring income in perpetuity to those rendered landless or dislocated due to such projects. Chairman of forum Kulbhushan Upmanyu said a detailed memorandum was being prepared for the purpose. It would include issues and demands pertaining hydroelectric projects, cement plants, SEZs, ski village and road projects against which agitations had been going on in various parts of the state. The forum was against allowing SEZs in the state where land was scarce. It wanted political parties to either endorse or reject its demands, he added. Similarly, it wanted that the term “public interest” in respect of acquisition of land should be redefined as taking over land for private commercial ventures did not serve the interest of the people. Only projects like roads, small eco-tourism projects that were essential for boosting the local economy be permitted in the ecologically fragile hills. The memorandum to be submitted to the Governor, the government and political parties would also call for classification of development projects into red, yellow and green categories, depending on their impact on the environment. At present the total burden on account of salaries is Rs 3,700 crore and another Rs 1,200 crore is incurred on payment of pension. The increase in salaries will not be on par with the employees of the neighbouring state as the Himachal government is committed to follow the pay-structure of the Punjab government and not the allowances. The state has its own allowances and much will depend on the extent to which it hikes the allowances. Similarly, in case of the retirement age the state is not bound to follow the recommendation of the Punjab Pay Commission as it has been following the service rules of the Central government. Since government is the main employer in the state and the number of unemployed has been increasing at an alarming rate, successive governments have been ignoring the demand of the employees for increasing the age of superannuation to 60. With the commission making a recommendation in this regard the government will come under increasing pressure on the issue. However, it was politically a ticklish issue as no party could afford to annoy young voters, which account for more than half of the electorate. Kangra SDPO OP Jamwal said Madhubala (24), a resident of Jarot village, was suffering from tuberculosis for the past three years and was admitted to the Tanda hospital on April 14. This morning when her husband Lek Raj went out Madhubala jumped from the first floor of the hospital building. She received a head injury and died on the spot. In another incident, Abhishek, a resident of Sakoh and a class XII student of MVM School, Kuthaid, was abstaining from his regular classes for which his mother rebuked him. He left his home on April 19 and had not returned. His parents lodged a missing report with the Kangra police. The SDPO said this morning his body was found hanging from a mango tree at an isolated place, near Banner Khad, on the outskirts of the town by a passer-by. Chief Minister PK Dhumal and Forest Minister JP Nadda had paid a visit to her house earlier night at Kasol village and expressed grief. She was the president of the district BJP and even its state secretary. However, at present she was the Director of HP State Co-operative Bank and also a member of the BJP state Executive Committee. On Sunday night Chauhan died when her car struck against a tree on the National Highway near Karnal in Haryana when she was returning from Delhi to Hamirpur to be present at the time of filing of nomination papers of Anurag Thakur. Five other persons who were travelling in the car were also injured. While passing this direction the forum headed by Pritam Singh also directed the dealer to pay Rs 50,000 as compensation and Rs 3,000 as costs to complainant Keshav Mani of Rampur. The forum passed this order on a complaint filed by the complainant alleging that she had purchased a truck from Goel Automobiles for Rs 6,96,092 and it started giving problem within two-three months of its purchase. A house has been destroyed in fire in Sanahi (Tarekad) village of Nadaun sub division this morning.